Chipotle mayo is now mainstream but if you have not had homemade chipotle mayo you are missing out. Chipotle chiles should be a part of your well-stocked pantry. What are Chipotle Chiles in Adobo Sauce? Chipotle chiles are smoked jalapeños. They are sold dried in the spice section either whole or as chipotle powder but this recipe uses chipotle chiles packed in adobo sauce. Adobo is a piquant sauce made of chiles, vinegar, herbs and spices. You might have to go to a Mexican or Latin American specialty store to find them but it is definitely worth the effort. Of course you can buy them on Amazon. Read more about these spicy chiles in my blog post, Chipotle Chiles in Adobo Sauce vs Chipotle Powder. Each little tin has six or seven chipotles packed in sauce. Once opened you can transfer the chiles to a clean jar and store them in the fridge for a long time…many months if you always use a clean utensil. For years I stored my chipotles like this but recipes always call for them to be chopped or pureed. It is a messy task so I now puree the whole can as soon as I opened it. I store the chipotle puree in a jar. 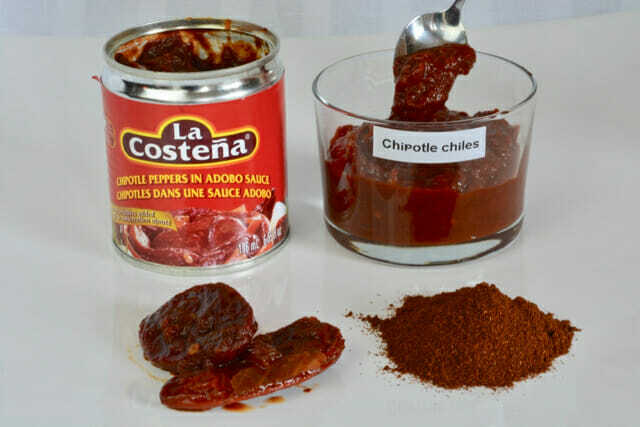 When a recipe calls for 1 chipotle chile in adobo sauce use this as a guide and adjust to suit your love of heat. Most brands are gluten free but be sure to read the label before you buy. La Costena brand was gluten free at the time of writing. Put this mayo in a squeeze bottle so when you see it in the fridge it will remind you to squeeze it on anything. Let me know in the comments below what you squeezed it on. In a food processor combine all ingredients except olive oil. Turn processor on and blend ingredients for 10 seconds. With processor still running slowly drizzle in the oil in a steady stream. Serve.